Testosterone BoostersUNS ZinMag6 - 90 kaps. 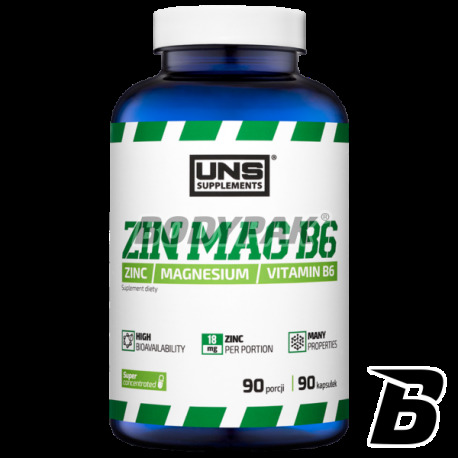 UNS ZINMAG B6 is the equivalent of a very popular product ZMA or a combination of Magnesium, Zinc and Vitamin B6 in appropriate proportions. 35 loyalty points Your cart will total 35 points that can be converted into a voucher of 1,40 PLN. 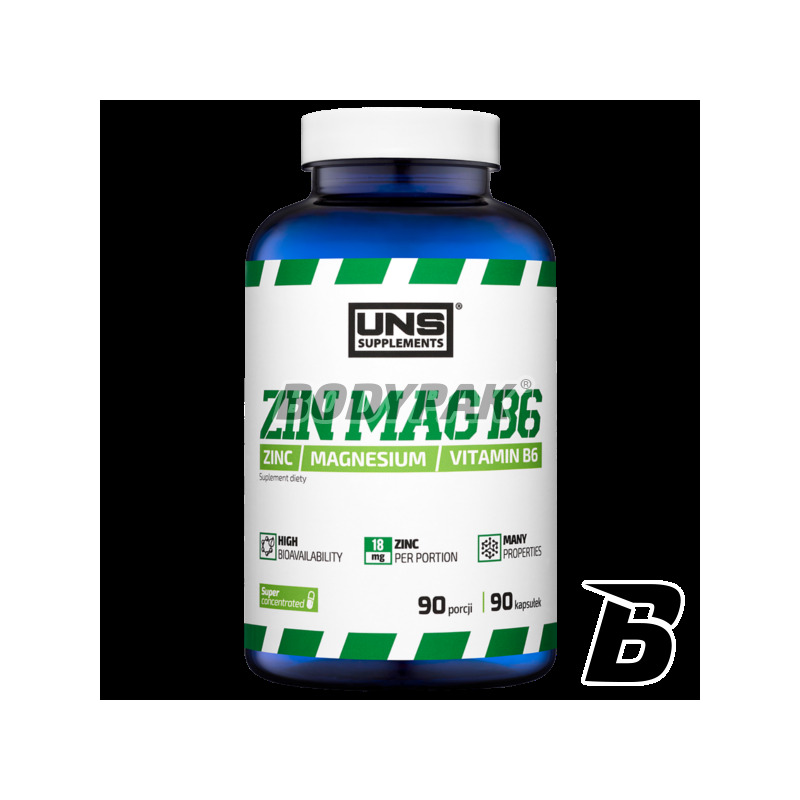 UNS ZIN-MAG B6 is the equivalent of a very popular product ZMA or a combination of Magnesium, Zinc and Vitamin B6 in appropriate proportions. The product was used UNS combination of amino acid chelates zinc and magnesium. This type of composition creates a non-steroidal legal and safe anabolic. UNS ZinMag B6 increases blood levels of testosterone, growth hormone and IGF-1 (insulin-like growth factor), and through the use of forms of chelated has a maximum absorption, so that these components can be transported with maximum efficiency and be absorbed into the bloodstream immediately after passing through the membrane intestines. Increasing the concentration of testosterone in the body in a direct way leads to accelerate the growth of muscle mass and strength. In addition, our body regenerates faster, raises the level of our libido, we have more energy and a better mood. ZMA significantly improves the quality of sleep and therefore the most regeneration processes take place at night has a significant impact on the recovery of the body. Ingredients: magnesium citrate, fillers: microcrystalline cellulose, starch, zinc lactate, anti-caking agent: magnesium stearate, pyridoxine hydrochloride. Działa tak jak powinno, co tu dużo mowić. Na pewno produkt wart tego, żeby dołączyć do swojej dziennej suplementacji . Bardzo fajnie rozłożone składniki w ciekawych proporcjach. Jak na tą cenę to jedno z lepszych ZMAA, Cynk i magnez w bardzo dobrze przyswajalnych formach, UNS się postarał. To co potrzebuje organizm dobrane w idealnych proporcjach. Stosuję od dłuższego czasu i zauważam duże tego efektu. Miałem spore niedobory magnezu, które udało mi się zniwelować tm produktem.